Arborvitaes (Thuja spp.) 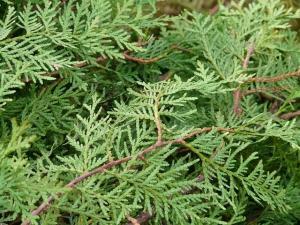 are evergreen coniferous shrubs valued for their fast growth rate and adaptability. They are unusual among shrubs for having a very narrow, upright growth habit. Arborvitae has scale-like leaves, giving them an appearance similar to cypresses, to which they are closely related. Their natural form is either columnar or pyramidal though varieties with more of rounded shape have been developed. Small cones appear in fall but they do not add or detract significantly to the appearance of the plants. 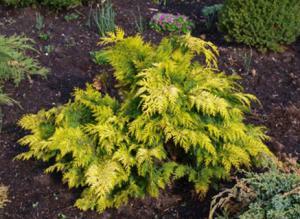 Arborvitae need full sun and well-drained soil. They perform best with rich soil and regular irrigation though they are drought tolerant once established and can survive in relatively poor soil -- but they look lusher if their ideal growing conditions are provided. 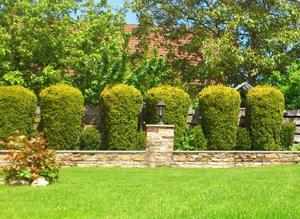 Arborvitae is among the most commonly planted hedge plants. The taller cultivars are unmatched as a tall screen while the shorter varieties are useful for foundation plantings. They can also be used as a tall focal point amid a bed of smaller flowering shrubs and perennials; the pyramidal varieties are especially well-suited for this purpose. Arborvitae is one of the most commonly available shrubs in nurseries across the country. Spring and fall are the optimal times for planting. To plant, dig a hole to the depth of the root ball and twice as wide. Loosen the outer roots of the root ball and set the plant in the hole. Fill in the remaining space in the hole with a 50-50 blend of compost mixed with the original soil. 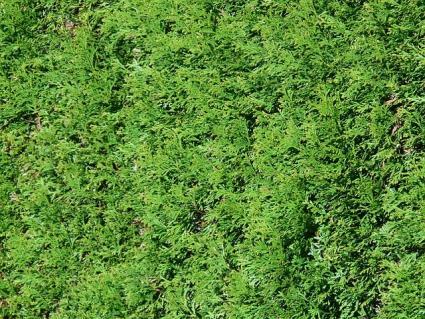 Water arborvitaes weekly if there has not been a soaking rain and keep a layer of mulch around the base of the plants. For faster growth, fertilize monthly during the growing season with a balance all-purpose fertilizer, such as 10-10-10. Pruning is not required, but can be done at any time during the growing season to maintain the size of the plants. Arborvitae may also be sheared into a formal hedge. Insect infestations occasionally show up on arborvitae, especially a type of caterpillar called bagworm. On small specimens, pick off the individual caterpillar and destroy them. Insecticides are the only practical means for treating bagworm infestations on larger arborvitae specimens. Many cultivars have been developed from the three main arborvitae species, providing a wealth of options for using the plants in landscape design. This species (Thuja occidentalis) is native throughout eastern North America and is hardy in USDA zones 4 to 7. 'Nigra' is a selection with deep green foliage that grows 10 to 20 feet tall and four to six feet wide. 'Holmstrup' has a highly columnar form, growing up to 10 feet tall but only three feet wide. The species (Thuja plicata) is native to the western United States and is hardy in USDA zones 5 to 7. 'Green Giant' is the fastest growing type of arborvitae, eventually reaching 30 feet or more in height with a breadth of 12 to 20 feet. This Asian species (Thuja orientalis) can also be found in nurseries and is hardy in USDA zones 6 to 11. 'Golden Ball' is a dwarf, gold-leafed form that grows to about three feet tall and wide. Arborvitae can't be beat for a tidy, vertical wall of green in the landscape, especially if you need something that grows fast. Unlike other similar conifers, its foliage is soft to the touch, making it a perennial crowd pleaser in nurseries.